The "TED-style talk" is the most-requested format I hear about from clients, whether it's communications directors asking on behalf of a principal, or the CEO or subject-matter expert looking to up their presentation skills. The popular TED conference and its offshoots have upended our expectations about presenting and public speaking, and that influence is reverberating in businesses, nonprofits, and universities around the world. I work with many clients--individuals and groups of speakers--who are aiming for this new standard, and I emphasize they should be aiming for TED quality, not just TED-style. There's much more to it than standing up without a lectern, or memorizing your talk. Until recently, I've only offered one workshop on how to plan, write, practice, and deliver a TED quality talk, and that was in England. But now, I'm opening 2 one-day workshops on creating TED-quality talks for which anyone can register as an individual. Both will take place in January 2016 in Washington, DC, although there are good discounts if you register early. Read on for the details! I debuted this workshop in April in Cambridge, UK, at the Spring Speechwriters and Business Communicators conference, and have been planning to bring it to the US ever since. 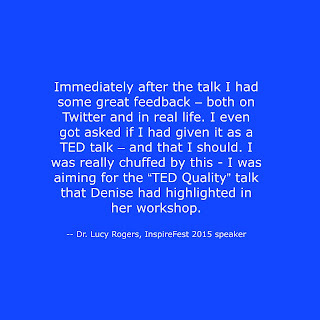 UK workshop participant Dr. Lucy Rogers gave the talk she worked on during the workshop at InspireFest 2015. She said, "Immediately after the talk I had some great feedback – both on twitter and in real life. I even got asked if I had given it as a TED talk – and that I should. 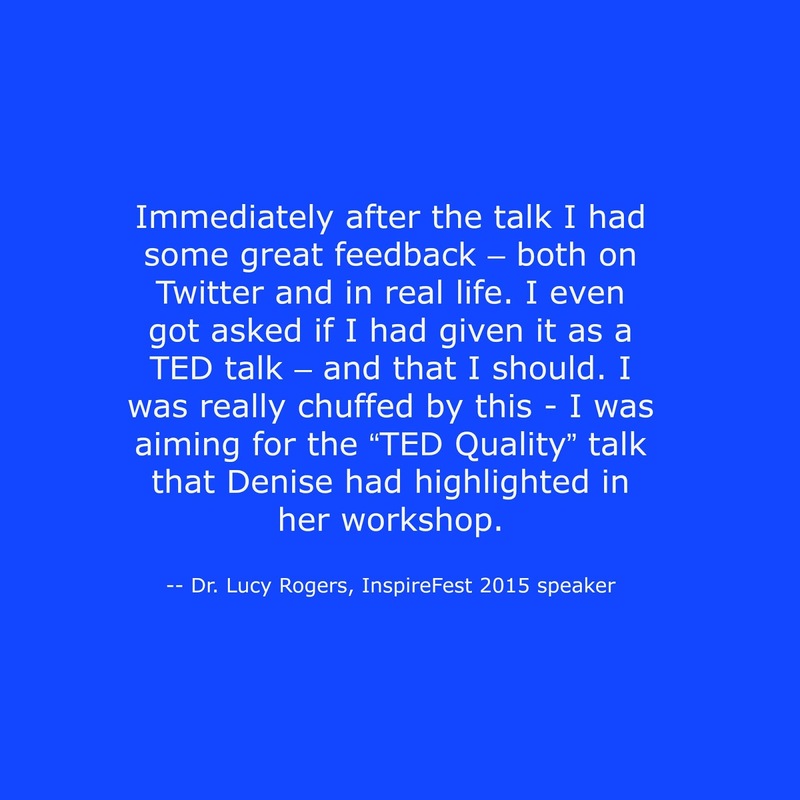 I was really chuffed by this - I was aiming for the “TED Quality” talk that Denise had highlighted in her workshop." I'm not just basing this training on watching a lot of TED videos. 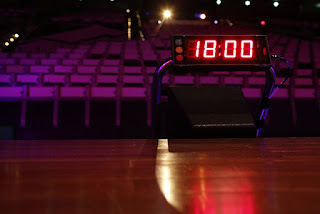 I've coached more than 100 speakers featured on the TEDMED or TEDx stages all over the world, and on TED.com. I've coached many more to give presentations and talks in the style of TED, based on that direct experience. You do NOT need to have a talk prepared to take this workshop, since the workshop is designed to walk you through the planning process. However, it will help if you can arrive at the workshop with some ideas about the "one big idea" you are hoping to communicate in your talk, and be prepared to discuss it. You can register for either the January 14 workshop or for the January 28 workshop. Registration is strictly limited to 5 people per session, to allow the optimum amount of interaction. Registration also includes continental breakfast, lunch, and an optional drinks hour at the end of the day. Details are at the links. Don't forget to read my workshop FAQ and policies--when you register, you are indicating you've read these important details on cancellation, refunds, and local travel and lodging options. Early registration is $724.00, a 25% discount. After October 30, registration at the full price is $965.00. 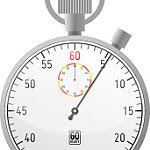 To get the early registration discount, please register by midnight Eastern US time on October 30, 2015. All registration closes when we reach full participation or December 31, whichever comes first. Want a bespoke training program instead? Each year, I train a few groups of executives in bespoke training programs that result in a cadre of speakers who can give talks in the style of TED. Sometimes, their organization or company is preparing them for a major conference, or providing leadership training, or developing a group of eloquent messengers for their cause or company. I've conducted this type of training for health care executives working for WellSpan Health in Pennsylvania; for the Robert Wood Johnson Foundation's Aligning Forces for Quality projects in 16 cities around the U.S.; and for The Nature Conservancy's Science Impact Project. You can read more about how this mix of workshop and 1:1 coaching works in my post on Coaching a cadre of conference speakers to give TED-quality talks. For more information about such a program for your executives, email me at eloquentwoman AT gmail DOT com. I'm looking forward to helping two more groups of speakers figure out this engaging way of communicating ideas, and hope you can join us. Please do share this information with colleagues and friends who may be interested. I hope to see you there!